Put beets on a large sheet of aluminum foil, coat with 1 Tbsp of olive oil and the salt and pepper. Seal foil tightly making a packet and roast for about an hour and a half. Cool beets until you can handle them and rub off the skins. You can use a paper towel to keep fingers a little cleaner. Cut peel away from oranges holding them over a bowl to catch any juice. Holding peeled orange carefully slice into segments and drop in the bowl. Put spinach on a serving platter or in a salad bowl. 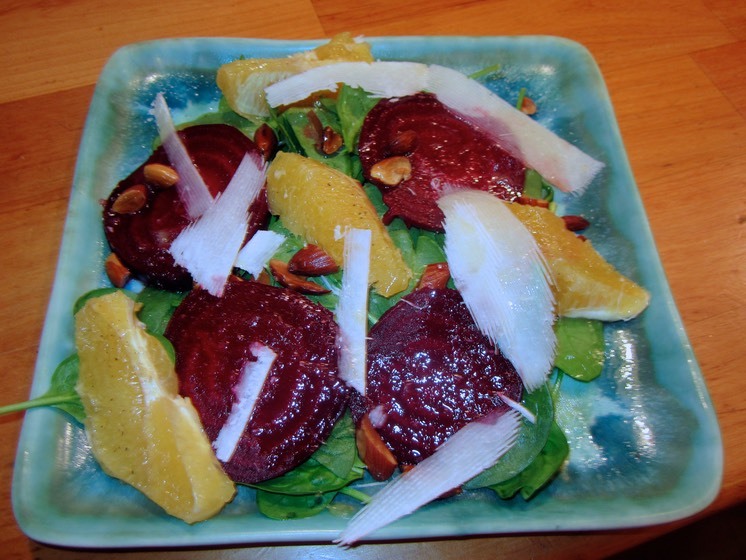 Top with beets and orange segments. Mix 2 Tbsp of olive oil in the bowl with orange juice left from slicing oranges. Pour over salad. Add salt and pepper to taste. Sprinkle with almonds and top with cheese. Voila! Your salad is all dressed up and ready for dinner! You can use candy cane beets (red and white stripped) if you can find them. Arugula is just as yummy as spinach. Actually any toasted nut is fine. Here’s the funny one and it messes up the Christmas theme, my husband asked for avocado on his instead of beets – go figure!